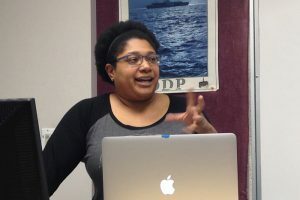 In this User Experience Case Study Workshop, UX Design Professor, Molly McClurg will teach you about case studies: the presentations that act as the building blocks of your UX Portfolio. We will discuss how to tell your story, explain your design process, and showcase what you’ve learned throughout the User Experience program. Please come to the workshop with an in-progress or completed project to use for your case study. It’s okay if you don’t think it’s “portfolio worthy” yet. Your coursework is completely acceptable to bring in! 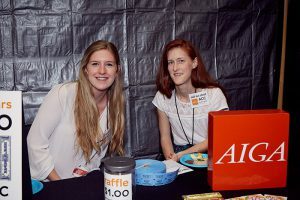 The ACC Foundation offers scholarships for ACC students based on financial need, family status, educational background, high school, or academic major. The online General Scholarship Application lets you search, view, and access hundreds of opportunities. Best of all, you only need to submit one application to be considered. The General Scholarship Application for the Fall 2019 semester is currently available. Applications must be received by April 1 for priority consideration for the spring and summer semesters. View all ACC scholarship opportunities online here. For questions about applying for scholarships, email scholarships@austincc.edu. The Print and Graphics Scholarship Foundation is offering scholarships up to $5,000 to eligible students. Applicants must be pursuing a career in Graphic Communications, Technology, or Management at a technical school or college located in the U.S. Applicants must also be a full-time student with a cumulative GPA of 3.0 or higher. The application deadline is March 1, 2019. To apply and receive more information, please visit The Print and Graphics Scholarship Foundation website. The Print and Graphics Scholarship Foundation (PGSF) is a not-for-profit, private industry directed organization that dispenses technical school, undergraduate and graduate fellowship assistance to men and women interested in a career in the graphic communications field. Join the AIGA | ACC student group for their kickoff event for the spring semester. At the South Austin campus, we will be hosting an Open Design Night for students to mix and mingle with their peers, work on their projects and coursework, and learn more about the resources that the Visual Communication department has to offer. We hope to see you there! You can learn more about AIGA and how to become a member online here. Join the ACC / AIGA student group as they present part two of their Business of Design series centered on building a portfolio. Visual Communication professors, Joseph Bullard and Russell Toynes, will be demystifying design portfolios and sharing their best practices for making a good first impression to employers. Come learn, network, and ask all of your unanswered portfolio questions in a casual cafe setting. The Visual Communication department is excited to announce that Molly McClurg, UX Design professor, will be producing two workshops for Austin Design Week! Thursday, November 8th – Designing an Experiment: What Can Designers Learn from a Scientist? So, what is Austin Design Week? Austin Design Week is an annual design-centered week composed of free workshops, talks, studio tours, and events that celebrate Austin’s creativity. The design community will be showcasing the best in visual, interactive, web, mobile, product, industrial, architectural and civic design. You can learn from top-notch designers for FREE! Boost your career skills, network with industry professionals, and explore the cutting edge work being done by some of the city’s most innovative creators! RSVP for ADW Events Today! Spring 2018 was yet another activity-filled semester for AIGA/ACC. In case you missed it, here is a quick recap of our events. 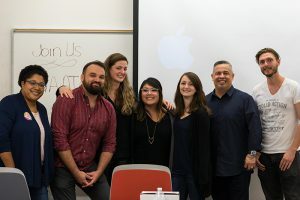 We kicked off the semester in February with a presentation from Anthony & Natalie Armendariz, founders of local design agency Funsize. 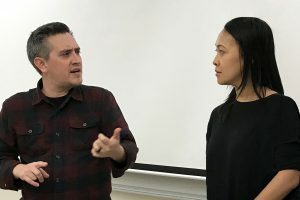 Anthony & Natalie shared their story in how they came to found one of Austin’s leading digital service and product design agencies. They also discussed the principles behind their business philosophy and the future of digital design. Afterward, they took time for a Q & A session from the audience. We want to extend a huge thank you to Natalie, Anthony, and their team for taking the time to share their experiences and expertise with us! Everyone had a great time and took away some valuable insights. In April, Professor Frank Curry of the ACC Department of Professional Photography provided a demonstration on photographing both 2D & 3D objects at our event “The World Is Flat: Copywork For Designers & Photographers.” Professor Curry explained some of the foundational ideas behind photography as well techniques to offer the best results regardless of the camera you are using. 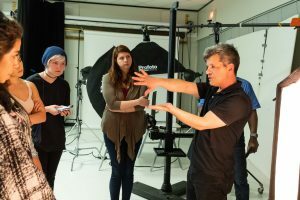 It was an informative evening and we’d like to thank Professor Curry for his time, as well as hosting us at the Photography Department’s Stonehollow Photographic Studio! We would like to congratulate our graduating officers, including our outgoing president Thomas Freeman, and thank them all for their contributions and hard work. We will be taking a break from events over the summer, but we will still be holding board meetings to prepare for Fall! In addition, we will also be assembling a new board of officers. If you have ever thought about participating, now is the perfect time to find out what we’re all about. For more information or to be added to the board meeting invite list, contact one of our faculty advisors. Follow us on Facebook for news and updates on all our upcoming events. We hope to see you there! 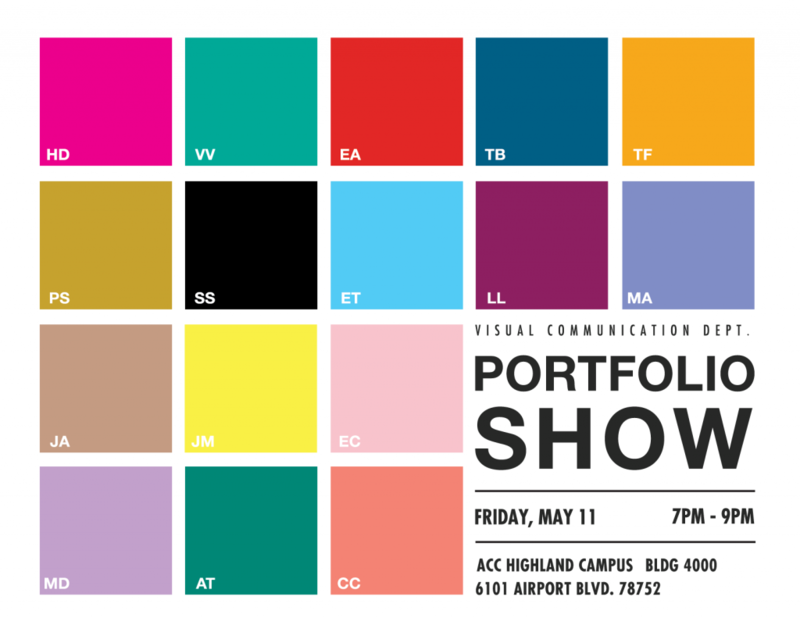 The Visual Communication Department held a showcase for our graduating students at ACC’s Highland Campus on May 11th. 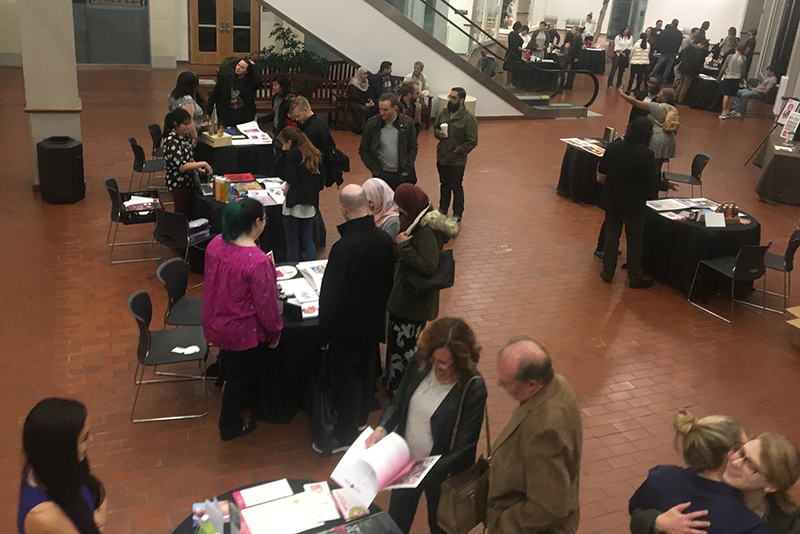 The evening was well attended by guests from the professional design community as well as family, friends, faculty, and fellow students. “It’s shocking how much the students manage to accomplish is such a short amount of time. The entire class worked feverishly the entire semester towards their goals. 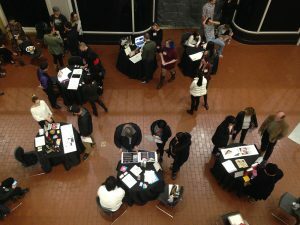 It’s at the portfolio show that they get the opportunity to showcase their passion for creativity and design,” noted Graphic Design Portfolio instructor Russell Toynes. Best of luck to all our graduates with all their future endeavors! We invite everyone to visit our website for a gallery of graduate portfolios, as well as more information about our department and programs. 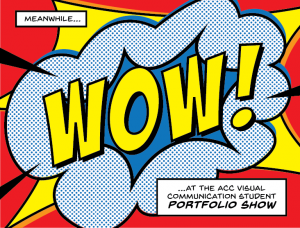 Last semester was a busy one for AIGA/ACC. In case you missed it, here is a quick recap of some of the highlights. We started off the semester in September with a pair of terrific presentations from Judy Shultz of OK Paper & Theresa Campbell of PIA MidAmerica. Judy discussed the importance of being confident in your work as a designer and communicating with your suppliers and printers. Teresa covered everything from the economics of the printing industry to augmented reality and AI. After their presentations, they held a Q&A session from the audience and Judy raffled off some swag bags from OK Paper! It was a lot of fun and we appreciate both of them graciously sharing their time and expertise with us. In October we got together to screen Debbie Millman‘s “A Brand Called You.” This engaging and informative video seminar was offered free for a limited time to AIGA members through CreativeLive. (Just one of the many benefits of membership.) I think everyone learned something and it was nice to share the viewing experience, discussing it as a group. We capped things off in November with a VisCom Alumni speaker panel, asking our guests “What do you wish you knew before graduating?” They shared their stories of starting out in the professional world, offering advice and answering questions. It was great evening and we thank all our panelists for joining us. It was a perfect example of the sense of sharing and community AIGA can foster and there was discussion of making this an annual event. Last but not least, we concluded the semester by electing a new board, with Thomas Freeman taking over presidential duties from now-graduated Cynthia Jefferies. We are extremely grateful to all our departing officers for all their hard work and excited to welcome all of our new officers to the team. We already have some exciting things in the works for Spring 2018, starting with a presentation by Anthony & Natalie Armendariz of local design agency Funsize on February 20. Follow us on Facebook to get the latest updates on all our upcoming events. We hope to see you there! 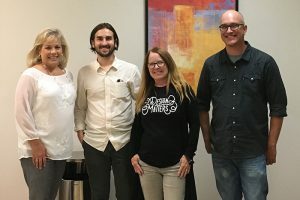 On December 15th, the Visual Communication Department held a showcase for our graduating students in the newly opened Building 4000 at ACC’s Highland Campus. Industry professionals, fellow students, faculty, family and friends attended the event to celebrate the accomplishments of these students. 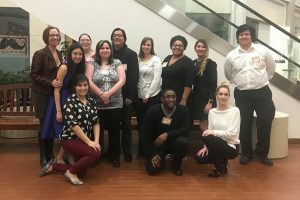 For the graduates, the show wasn’t just the cap to a very intensive semester, but to their entire journey through the Graphic Design program at ACC. Their hard work paid off with some impressive displays to share with the evening’s crowd. We’d like to extend our congratulations to all our grads, we look forward to seeing what you can accomplish! If you were unable to join us, you can view the online portfolios of this and previous semester’s graduates in our gallery of graduate portfolios. © 2018 Austin Community College and the Visual Communication Department. All Rights Reserved.